Sweep is an open-source, features-rich audio editor for the GNU/Linux platform. It’s written in GTK2+ toolkit and supports lossy audio formats such as MP3, OGG Vorbis, Wav etc (including Raw audio formats such as .pcm). Audacity is still like the ultimate tool and when comparing Sweep’s icons feels like a bit outdated but when considering its features it is still well worth the try. However, being a bit outdated utility, Sweep only supports the OSS audio server and since Ubuntu uses the PulseAudio by default, Sweep will give you errors while trying to play a file for instance. But thanks to the PusleAudio’s OSS emulation (kinda), we can easily fix that. We can edit MP3 files but cannot save them in MP3 format (due to patient issues) and it can be a bit of an issue for some. But of course you can use Ogg or something else instead if it is okay with you. *. File format supported: MP3, OGG Vorbis, WAV, AIFF, Speex, AU, Raw PCM (no lossless codecs supported) etc with 8 to 32-bit. *. Easy GUI editing window with Zoom in/out, Copy/Cut/Delete/Paste, Cut previewing, unlimited Undo/Redo, access a “history” of previous editing for easy undoing, crop, scrub, easy select tool, a “hand” tool and more. *. Playback buttons are located at the bottom. *. Automatic cursor playback following (can be disabled). *. “Mark” audio sections for easily locating them. *. Few built in color schemes. *. Audio properties window that shows some basic info such as Sample rate, duration, track name etc. *. Resample, duplicate, swap, add/remove/edit channels. *. As mentioned, has a huge list of built in audio filers (using LADSPA framework) such as: aliasing, AM pitchshifting, audio delay, amplifier, fade in/out, low pass filters, vocal cancellation, sample amplifier and more. *. Advanced playback controls like: play selection/sample/loop, go to end/beginning etc. *. Save in huge number of audio formats (other than MP3) such as: OGG, WAV, FLAC, Speex, Aiff, Raw, VOC, MPC, AVR just a few to mention (anything supported by the “libsnd” audio library actually). 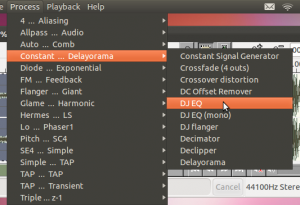 If interested, you can install the Sweep audio editor in Ubuntu 12.04 Precise Pangolin, 11.10 Oneiric Ocelot, 11.04 Natty Narwhal, 10.10 and 10.04 by simply typing the below command on your Terminal. When trying to play something you should get the error saying “unable to open device /dev/ …” as shown below. Then follow the below instructions to fix it. As said, Ubuntu uses the PulseAudio sound server but Sweep uses the OSS sound server. But by using the PulseAudio’s “OSS wrapper” (sort of an emulator) we can fix it easily. But the only drawback with the below method is that, every time you want to run Sweep, you’ll have to type the below command in your Terminal. So to fix it simply type the below command in your Terminal window. Another thing that I noticed with Sweep is that, if I accidentally clicked the “close” button after doing some changes to an audio track, it would just exit even without asking me!. So please be aware of it. But other than that, Sweep is a pretty sweet audio editor :). Good luck. The version of Sweep in Debian has been patched with support for ALSA now. Should be easy enough to install in Ubuntu. Just for testing, few minutes ago, I re-installed it and tried to run. But it keeps crashing and won't run at all (using Ubuntu 12.04). Thanks for the update though, appreciate it :).